First trace a circle on the card stock paper and on the wrapping paper, and then cut both circles out. I let the future voter glue the wrapping paper on top of the card stock. I showed him how we make patterns with colors and he glued down the stars (a glue stick works best with these wee little ones). 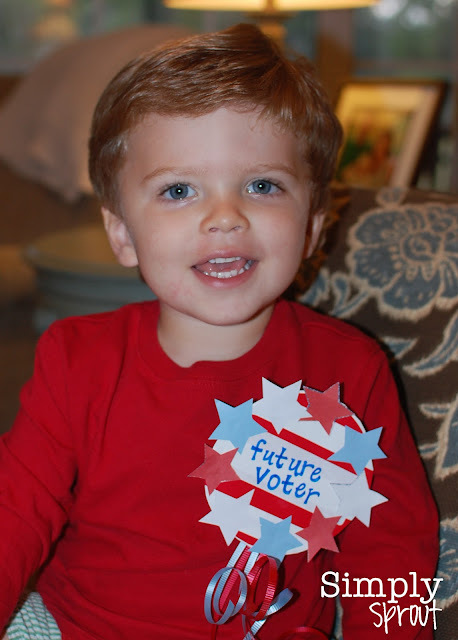 While he was busy gluing, I wrote out "future voter" on the mailing label and stuck it down in the middle of the circle. We cut a couple of pieces of curling ribbon, taped it to the back, and stuck on the name tag pin. I look forward to making these with my students on Tuesday. To speed things up in the classroom, I am going to use a die cut circle and stars. Of course my students can do the rest of the creating! How cute will they be at the poll with their parents on Tuesday?! Another way to bring some election excitement into your home or classroom is through a cookie taste test. You could choose any two types of cookies, or use the ones below from Michelle Obama and Ann Romney. 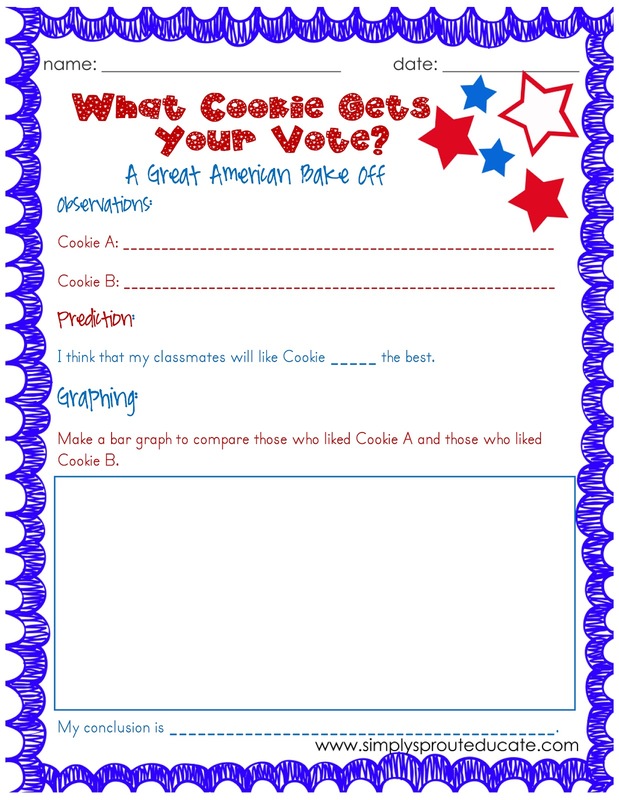 Here is a free printable to use with your kids to find out what cookie wins the popular vote! Heat oven to 375 degrees Fahrenheit. In a small bowl, whisk together flour, baking soda and salt. In a large bowl with an electric mixer, cream butter, vegetable shortening, granulated sugar, brown sugar and vanilla extract. Add eggs, 1 at a time, beating well after each addition. On low speed, beat in flour mixture. By hand, stir in white and milk chocolate chips, mint chips and walnuts. Drop rounded tablespoons of dough onto ungreased baking sheets. Bake at 375 degrees Fahrenheit for 10 to 12 minutes or until golden brown. Cool on baking sheets for 5 minutes, remove to wire racks to cool completely. Heat oven to 325 degrees Fahrenheit. In a large bowl, cream sugars, butter, peanut butter and corn syrup on high speed until well combined. Beat in eggs 1 at a time. Beat in vanilla extract. In a separate bowl, mix together oats and baking soda. Stir into peanut mixture until combined. Mix in chocolate chips and M&M's. Using a standard-size ice cream scoop, drop dough onto baking sheets (about 9 per sheet). Bake at 325 degrees Fahrenheit for 18 minutes or until lightly browned. Cool 2 minutes, then transfer cookies to a wire rack to cool completely. For more presidential lessons check out our Presidential Pack in my Teachers Pay Teachers store.